In the paperback book field, there’s an old saying that “green covers don’t sell.” Costume designers have told me that green often looks ghastly in stage lighting. Gallery directors have reported that clients aren’t attracted to paintings with a strong greenish cast, especially if the color tends toward a bright yellow-green. Here is a plein-air study where I tried to match the colors that I saw without modifying them. There is no doubt that green is a fundamentally important color. Many modern psychologists and color theorists regard it as a primary, not a secondary, color: indeed green is a primary color of light. The word “green” is occurs more than twice as frequently as “yellow” in modern written English. The human eye is more sensitive to green wavelengths than to any other; that’s one reason why flourescent lights are designed to give a peak output in the green range. So why do many painters recoil in horror from certain pigments, like permanent green light or pthalo yellow green? Why do many artists banish green from the palette? For those of us trying to be true to Nature, should we be faithful to our mistress, or is there a legitimate reason to neutralize the strength of green? Why should there be a problem with green? What has been your experience? One more bit of trivia: 79% of the flags of Europe contain red, while only 16% contain green. 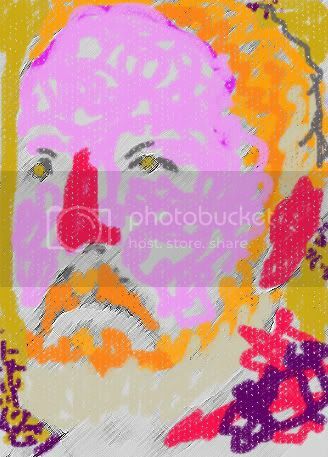 Thanks to Handprint.com for the color diagram. I admit to having a love/hate relationship with green. I have done paintings that had quite a bit of green in them and found myself fighting to tame them, make them somehow less jarring. I'm reminded of a quote from an artist whose name I forget: "There are only two kinds of green. Green and damn green." I don't agree with the quote and despite my slight aversion to green, I put a lot of thought into what pigments combine to produce the most pleasing greens; cool greens, warm greens, gray-greens. I have found that greens alongside some kind of violet or blue-violet are very pleasing and interesting. It may be that they seem a logical chromatic extension of the blues. Anyway, I loved your plein air study...but look at the lovely juxtaposition of blues and greens! Oddly, my first book from Tor has an almost entirely green illustration from Stephan Martiniere. (See http://www.amazon.com/gp/reader/0765317087/ref=sib_dp_pt#reader-link -- though the Amazon scan has gray shifted it quite a bit from the actual illustration.) It has exhibited very strong cover appeal on the shelf, to the point where the hardback sell through was excellent. Even more oddly, my third book from Tor is entitled Green, and the early marker comp I've seen of the cover also relies heavily on the color green. I have to admit that I as totally unaware of this 'problem' and that I use green a lot in my painting. Sometimes I think that artists think too much. I usually find that if I try to consciously think about everything I am doing that my picure ends up being less effective than when a lot of the decision making is done subconsciously. I mix my greens, I have Viridian on my palette, but I mix this as well. You can mix greens from a fair amount of combinations from Ivory Black and Cad Yellow Light to Purple Blue and Cad Yellow or any yellow for that matter. I had a teacher who I studied landscape painting with and he would have us mix greens to maple leaves, we were in Vermont. The top side of the leaf is rich bright green depending on the time of year of course, and the underside is more defused in chroma. The idea was to mix greens that were not to acidic. We mixed 9 values of greens the first 6 using a Munsell notation were 1.5 through 6. This green was mixed using Ultramarine Blue with a little Alizarin, (a violet) and then mixing it with Cad Yellow Lt. The next 3 values 7 - 9 were mixed using very little Pthalo Green(I use Viridian now) with White and Cad yellow Lt. This got a little tricking and it was easy to get acidic greens. I think if you mix green using some violet that you can control it better. I also have a strings of grays and blues to help control the chroma and values.If I use the complete palette it has strings of greens, violets, and blues. For the landscape painter there is the issue that you can't compete with nature. That paint can only cover so much value and chroma wise. So I think for me anyway that I try to come up with a good harmonic devises that works within the context of the painting. Honestly, I had no idea that there was a green "problem." It's interesting to ponder, however. The only reason I can think of for a green prejudice might be because it's so dominant in most landscapes. Perhaps some just get tired of it. I happen to be quite fond of green, and don't people fill their houses and flowerbeds with green plants? Maybe the range of greens in nature is just too wide for most artists to replicate skillfully. I admit most of the art on my walls is neutral to warm colors, as with most of my furniture. The houseplants provide the cool greens in my decor. Green is one of my favorites and I love to see it around in clothes,bags,plants,old trees in my windows,but i just have to say your post made me noticed something:my tubes of green watercolor are untouched,when all the others are more or less used!So,clearly,even if I´m a big fan of green in daily life,when it come to paint I keep a certain distance!I still remember some beautiful portraits I saw in dominant green,I still consider the green-olive and violet in all nuances are great together,the same with green and orange,which is a very eye catching combination(but maybe this is more personal,because remind me of some sweet things from childhood:)),but is neverless true:blue sky with green land on canavas make me feel like something is missing,like a stage without characters!Still I like your study a lot,but how many can play with a landscape like this and manage to make it atractive?Congratulations!I appreciated also the comments before,lot of interesting info!! I only mentioned a dozen times on this blog that I'm slightly colorblind. So here I go again for those who haven't read it: I'm slightly colorblind. As my sensitivity to green is much weaker then, ahum, 'normal' people, green gives me a lot of pains. Quite often viewers remark that my greens are too strong. Although I must say I've heard people disagree on this over my drawings/paintings. Reason I'm bringing this up is that I think their might be some scientific explaination to The Green Problem in Art. 1. about 10% of male humans are slightly colorblind and thus have a weaker vision for green (or red). 2. A certain amount of woman also have a 'defect' but quite the opposite : they don't have 3 types of cone cells to detect red, green and blue, but a 4th one to detect yellow-green light! 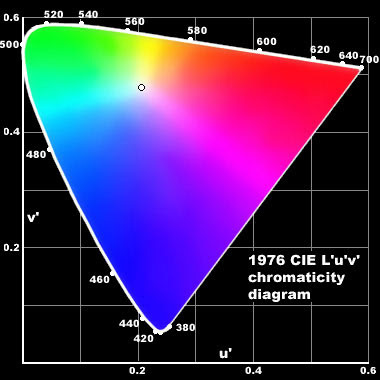 A wiki page on Tetrachromacy. So what we have here is a clash of the sexes : 10% of males have a weaker vision in the red to green region, while 10% of the women have a stronger sensitivity to those colors. It's even worse, it's a clash between 'normal' people, colorblind people and color-super-women. My solution to please all is to add an orange wash to my paintings, especially the landscape parts (not the skyes). And orange, is technically light-brown isn't it? So am I not doing the same as those academic painters that applied a thick and dark layer of brown over their paintings? p.s. I looked at jaylake's book cover. The colors do not please me(sorry): I do see it's green, but it looks cold and gray (unsaturated green) to me. As I think this is due to my little handicap, about 10% of males may agree with me. That's 10% less income for a writer. To recap : I think the differences in color vision we have may have caused artist to find a way to please all, that is, stay clear of green! I love your plein-air piece. Green is probably my favorite color and I gravitate towards it in art and home decor. I guess I am unique in that. Go Green! I generally just lurk around here and take note of all of James' precious tips, but since the audience's opinion is requested, I'll try to throw my 2 cents in the discussion. I don't know if it's because I'm a woman (:-D), but I like a touch of green in my colors. Like James' friend, I often notice how strong the greens (and other colors too, actually) are in nature - but they'd probably look too fake if reproduced like that in any visual media. Odd, isn't it? This said, I think that when used as a dominant color green suggests lack of air and light. I don't know if it's because we tend to associate it to some kind of clinical atmosphere. I also saw that Frank Frazetta used a lot of green in his jungle paintings - not just because the jungle is green (duh! ), but because, I think, it gives a rather "dark" feeling to the picture. It makes the viewer rather uncomfortable, but it also stands out... So probably all those gallerists and book cover designers are right, to an extent. But it's because green causes strong reactions, like red. Re: costume designers - it's also true that green looks awful on most people with a pale complexion, making it paler if not yellowish. poggy, green clothing on a pale red headed girl is the greatest color combination known to man!! I've actually been giving this a lot of thought lately. Unless I'm painting the Hulk, I tend not to use any green at all (and even then, it's subdued). But in addition to that, I only use yellow when I'm painting a green object in a painting. I find that yellow turns just about every mixture into green unless there's red to counteract it. Most of the yellow in my paintings comes from the undertones of my burnt umber and sienna, both of which have dominant red components. Also, I've been painting a lot of olive drab lately for WWII army uniforms, but it's just a simple mix of jet black and yellow ochre (I paint mostly in gouache and acrylic). As for any reluctance to greenish casts, I would imagine a large part of that stems from skin tones, which tend to look "unhealthy" when green unless a surrounding environment of cool color resets our white balance. When designing one of my new sites I specifically went for the "yellowish-green" that for years art directors and clients alike have had such predjudices against. And I always wondered why? Personally I like green quite a lot because it can be a neutral for a cool or warm color that can bend in either direction. My hope is that the strength of my work attracts the kind of clients I want. At least that's the theory anyway. I'll second what Raluca wrote - I like the colour green, but now, when I come to think about it, I realize that I very rarely use it. One exception is, ironically, for a book cover I've made. I'm a lurker but the subject of green fascinates me so I'll raise my head above the parapet. I would hazard a guess that the problem with green is that the natural green seen in leaves and grass etc. can't be reproduced exactly in paint, textiles and lighting and as such, we're repelled by the unnaturalness of it. I've got a huge oak tree staring at me outside my window right now and the leaves aren't green, they're a mix of almost white veins on the leaves, dark veridian shadows leaning to brown, yellow highlights and even a bit of orange here and there on dead leaves and twigs. The same with grass, there are little accents of white where the grass has dried and brown where you can see the earth. Reproduced greens can't capture all the different shades simultaneously (there are exceptions in paintings however before I go over generalising) and fall flat. The green leather seen on clerk desks and in our house of commons is a prime example (to me) of a repulsive green. It's just too.....green. The connotations with the items and surroundings may also play a part but there's my thoughts. I'm guessing here, but I assume that most people would hang a painting in common areas - lounge rooms and dinning rooms. And the green in the painting would stand alone as the main green in these rooms. Few people would have a green sofa or a green table cloth. I think the question of green is all about context. I can see painting a portrait using a verdaccio under-painting and not painting over it well enough so the figure is leaning to much to green as a problem. In landscape I think it's a question of design, composition and so on. If you look at Clyde Aspevig's work you can see that he uses this idea to great advantage. You don't notice the green at all you notice the painting. My painting teacher told us many moons ago that green in landscape painting failed usually because it was to acidic, and that we as painters had to find a harmonious resolution to this problem. That is some greens are by nature acidic, and when you try to paint them this can lead to a magnification of the effect. He stressed always mixing the most non-acidic greens at the right values and that if you nailed this no one would notice. this is very interesting... I had never really known of this before. I myself love green - my bedroom and study walls and alot of my clothes are green etc. These are really helpful and insightful comments. I realize that I have overstated the case about the “green problem,” and I should qualify it a bit. The issue is not with the color itself, or its use in clothing, etc. I count myself as an enthusiastic supporter (and wearer!) of green. The problem I’m really talking about is what Doug mentioned, GREEN everywhere, unmodulated chlorophyll-green (one friend of mine calls it “vegetable green”) in landscape painting. That’s the problem Durand was talking about, too, and his remedy was to look carefully for variation in the green colors of natural foliage, so it’s not all one color. 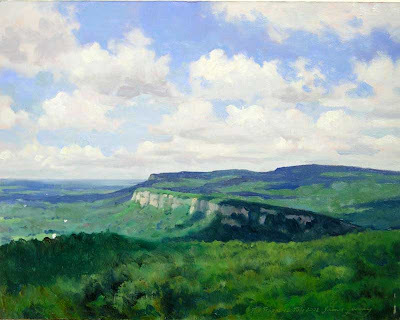 In fact one of the things he was responding to was the tendency for his fellow Hudson River painters to paint only autumn scenes, and he was advocating an approach to painting summer landscapes, which, if you’re not careful, tend to that “damn green” John mentioned. I agree with Jeff and Paolo and others that the key to greens is careful mixing, and that’s why I sometimes don’t bring tube colors of green on location in the summer. If I have to mix the greens from their components, I’m more likely to get variety. Back when I was studying light design as a theatre major in college, the first rule we learned was to never, ever use green light unless we were staging a horror scene. And I don't know why, but it is completely true. Green light makes actors look menacing or sickly. It makes scenery look ominous. And green costumes reflect green light and that's why they're almost never used, with the exception of Gone With the Wind, I think. I suspect that humans have become so sensitive to green because that quality aided our chances of survival. We're really good at seeing green, just the way we're really good at reading human faces...because it's important to know whether something/someone is good/bad for us. As for using it in paintings, I struggled with it until I began to use Munsell to analyze landscapes, florals, etc. and seeking color harmony became much less problematic. I also forgot to mention that good understanding of atmospheric perspective and and without studying this one wont get a handle on how to create the illusion of depth in a painting. As things recede they lose chroma and become more defused. I always use gray scales(Munsell)to help control the HVC and as I mentioned before I also mix Blues, Greens and sometimes Violets that relate to the Gray scales in value. This is a lot of mixing, but for me it helps as I can look at the palette and it already reads as a landscape in the abstract. I was just wrestling with this YESTERDAY!!! Amazing that I would come over to the 'journey,' seeking inspiration and find not just some more inspiration, but an entire post devoted to my plight. This may sound funny, but I like green because it is rich. Thanks to it`s friends positive impact, blue and yellow, green is so refreshing. Especially when the sun shines through all kind of young and adult leaves, granting us splendour. ps. : By the way, I really fell in love with this blog as soon as I found it! Very good job. For many years there lived only some dinosaur pictures on in my mind, and almost faded into oblivion. A few years later, the Jurassic Park movie hit the theatres and that was a small compensation. To my shame I have to admit, that I never did a research on this Dinobook again. There was no internet way back then, and the two volumes at the bookstore were sold out fast. And then...over the years I must have forgotten. There seemed to be more important things than dinosaur stories with pictures. Hmm, but somehow the circle is getting complete. Well almost, at least until I have enough jinx to spend on these marvelous volumes. psss. : And last but not least Mr. Gurney, I wish you many, many more happy years of excellence while creating these fantastic stories and paintings. Great post on "green". Could it be that the fellow who describes past greens as muted doesn't realize that it is a mixed color? I have to disqualify myself from making observations about public green prejudice. As an artist, I am wholly enamored of green. I have a problem using green straight out of a tube. But, I have problems using a lot of colors straight out of the tube. For green I use a bright, spazzy modern yellow with black or indigo. The modern yellow isn't too quick to tone down, so I get a nice green. I only use viridian green with alizarin to make a beautiful blue. And a bit of yellow ocher or cad yellow makes a nice green with that. I must say in landscapes, I use a lot of red and blue, and then add the greens and yellows to the painting. I think the problem might be getting the value of the greens right. We know somethings off, but we can't see past the jarring color we just put down. So we just shy away from the color. I know I've done that before. But I haven't done much landscape recently. I should get back to that before winter hits. Thank you so much for this article! I always thought I was strange for avoiding the colour green in paintings, apart from when my entire colour scheme is predominantly green. All this makes perfect sense. An extremely interesting read! I have an answer, at least, for why European flags contain hardly any green - green was not considered a classical heraldic colour (or tincture), so that the flags that are derived from medieval heraldic devices contain little or no green. This has been fascinating reading. I'll have to go back and look at my work and see how much green is there. "Constable was having an argument with a friend about conventions of representation in landscape painting. The friend was trying to persuade him to paint grass as Poussin did, in the honeyed tones of an antique violin. To refute him, it's said, Constable took a violin and laid it on the lawn, inviting him to make a direct comparison between the two. Painted grass should be the same colour as real grass, was his point." Maybe the aversion to green grass was part of a deeper issue about the perception of green and the differences between nature and paint.